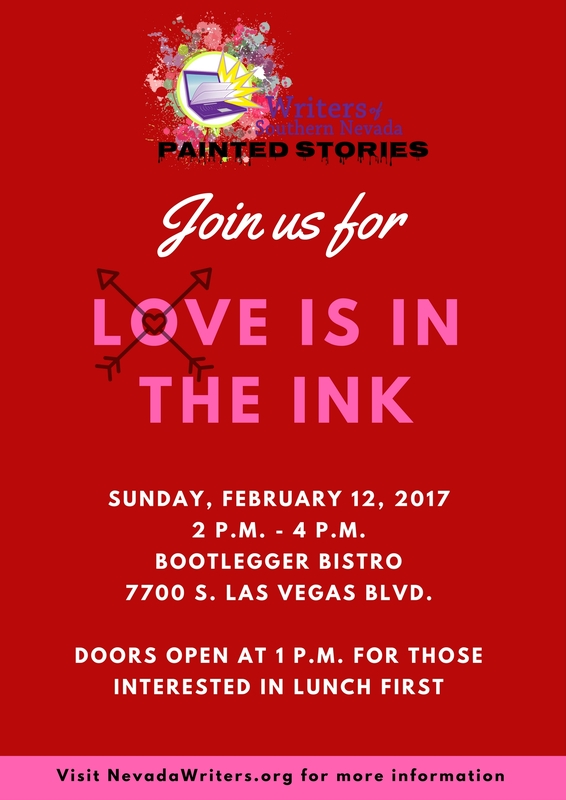 Join us Sunday, Feb 12, 2017 from 2-4PM in the private dining room at the Bootlegger Bistro (7700 S. Las Vegas Blvd., just north of Blue Diamond) for the next installment of Writers of Southern Nevada’s PAINTED STORIES series. We are going back to our original format for this one. There will be three Featured Authors and one Guest Artist up on stage doing pen & ink sketches as each author reads a 10-12 minute excerpt of their work. A Q&A with the authors and the artist will follow each segment and we’ll be auctioning off the artwork at the end. Our Guest Artist this month is: Audrey Fox (www.audreyfox.com) a multi-talented multi-media artist who will be creating detailed sketches with pen & ink and colored pencil. Our Featured Authors are: Morgan St. James reading a short story entitled “The Second Time Around”, Tonya Todd reading a chapter from her w-i-p novel and singer/songwriter Tim Veazey reading/performing “After Riverside”. Doors open at 1PM for lunch. Join us Sunday April 24, 2016 from 2-4PM at the Jewel Box Theater located inside the Clark County Library at Flamingo & Paradise in easy to get to central Las Vegas just a half mile from the famous Las Vegas Strip. Our Spring Theme is “Following Your Dreams” and authors Vital Germaine and Geoff Schumacher will be reading from their work while our two Guest Artists turn blank canvas into works of art based on their words live before your eyes. 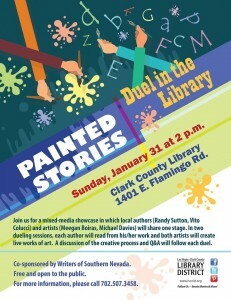 There will be a brief Q&A between each reading with the authors and artists. 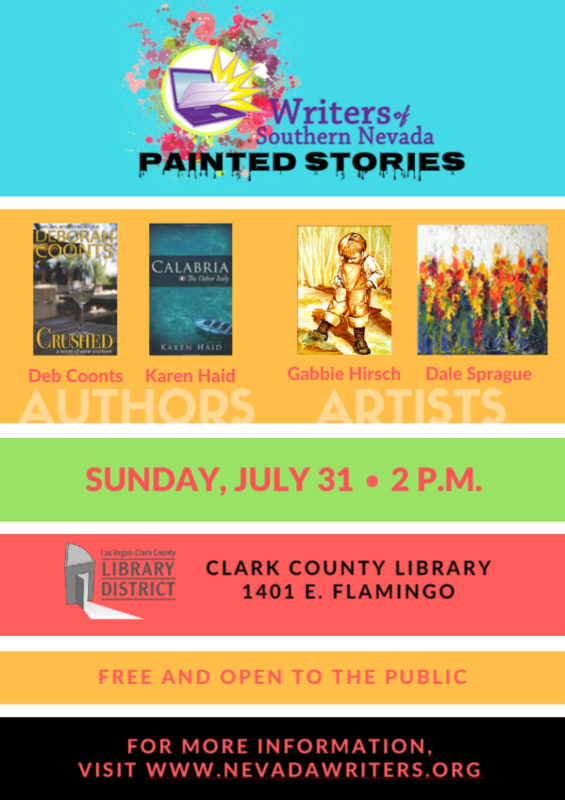 Come on down to the Jewel Box Theater inside the Clark County Public Library on the corner of Flamingo & Paradise Sunday January 31, 2016 from 2-4PM for a very special fourth installment of Writers of Southern Nevada’s popular PAINTED STORIES series. In honor of Mob Month, we will be featuring authors Randy Sutton, a retired Las Vegas Metro police officer, and Vito Colucci, a private investigator who made a name for himself investigating mob activities in Stamford, CT.
For the first time, we will be featuring two artists on stage with each author to double illustrate the fact that not only is a picture worth a thousand words, a thousand words (or so!) can be worth more than just one picture. 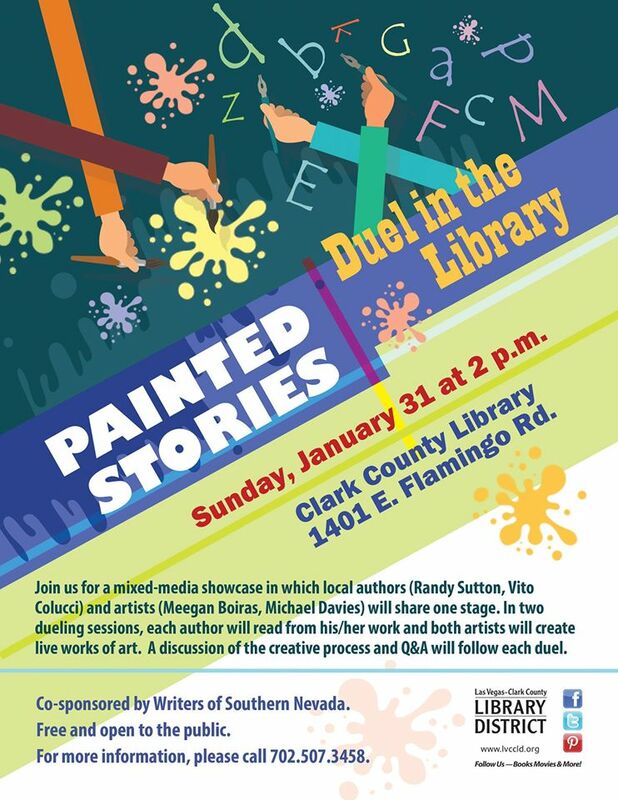 Our professional Guest Artists for this very special event will be Michael Davies and Meegan Boiros so be sure to circle your calendars for this very exciting blend of literature and art! 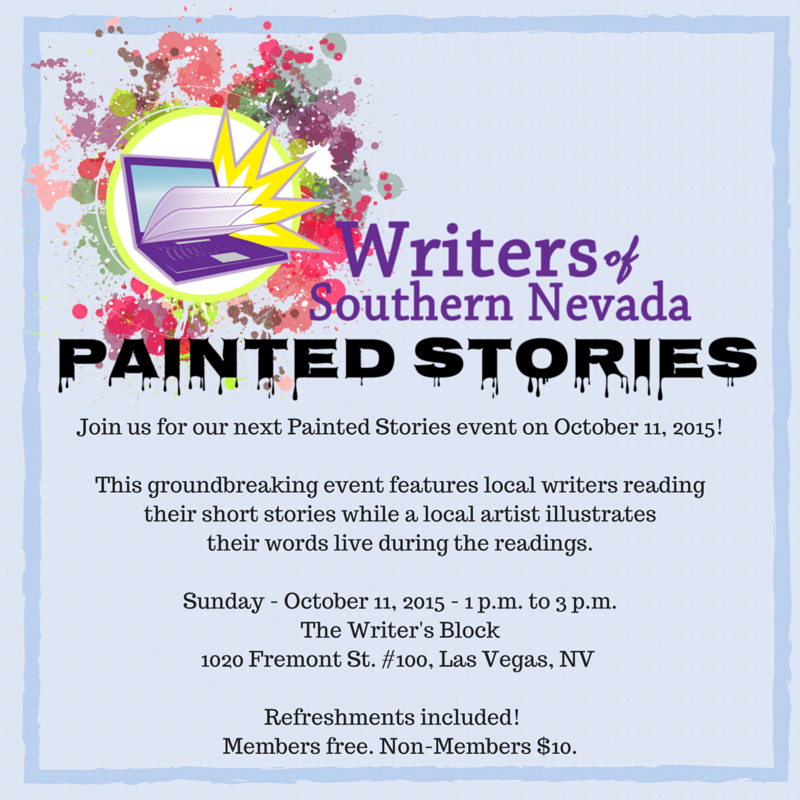 Join four local authors and a special guest artist for an afternoon of story inspired art! 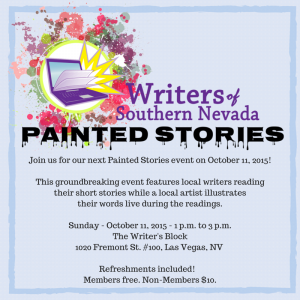 Authors will read 10-15 minute short stories, fiction and/or non-fiction excerpts of their work as our artist uses their words as inspiration to turn a blank canvas into a piece of art live in front of the audience. Cost: Free for WSN members, $10 for non-members. If you would like to be a reader, submit either a short story, piece of narrative non-fiction or excerpt from a longer work that can be read in 10-15 minutes. Keep in mind, your piece should have a limited number of settings and have a strong sense of character for our artist. It should also have at least some sense of a beginning, middle and end (or at least a hook!) to satisfy our listening audience. Free to enter! Deadline for submissions is April 30th. Selected authors will be notified in early May.